JAJA Santiago is uncertain on playing her fifth and final year with National University after a failed Final Four attempt in the UAAP Season 79 women's volleyball tournament. 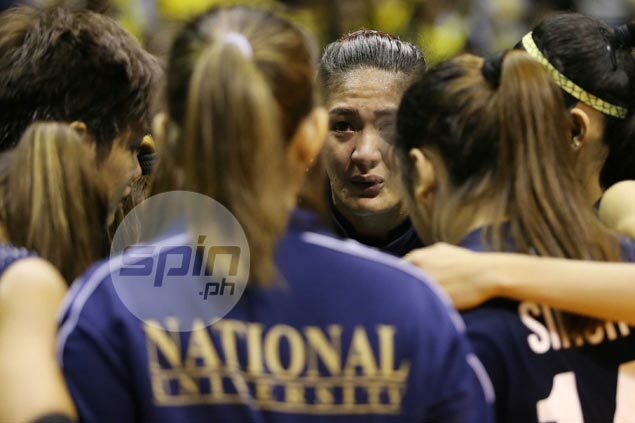 The fourth-year middle blocker was in tears and inconsolable after NU bid its Final Four hopes goodbye following a heartbreaking 25-20, 25-19, 22-25, 21-25, 12-15 loss to University of Santo Tomas on Saturday at the Smart Araneta Coliseum. She was also in no mood to make any commitments as to her future. "Still undecided po. Hindi pa po talaga ako nakaka-decide," said the 6-foot-5 NU skipper, largely regarded as one of the top volleyball players in the country. In her last game of the season, Santiago led NU with 30 points but her efforts went down the drain as the Lady Bulldogs missed the Final Four for the second straight year. The last time the Lady Bulldogs made it to the semifinals was when they finished third in Season 77 when they lost to La Salle in the step-ladder semifinals. NU was tagged as one of the preseason favorites this season but finished with a 7-7 win-loss card, the same record it had last year. Santiago will soon join Foton in the buildup for the Philippine Super Liga All-Filipino Conference and resume training with the national team after she was chosen to be part of the pool for the Asian Women’s Senior Championship and the 29th Southeast Asian Games. But she declined to make any commitments beyond that, adding to the cloud of uncertainty hovering around NU which saw head coach Roger Gorayeb tender his courtesy resignation after the failed campaign. The veteran mentor will handle BaliPure in the Premier Volleyball League, formerly Shakey's V-League, which starts on April 30.